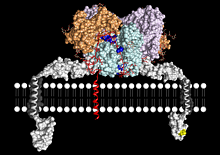 An international research team led by the Spanish National Research Council (CSIC) and researchers from Kiel University revealed the atomic-level structure of the human peptidase enzyme meprin β (beta). The enzyme is related to inflammation, cancer and Alzheimer’s Disease and is involved in cellular proliferation and differentiation. The knowledge of the enzyme structure will allow for the development of a new medication type different from those known up to now. The study was published in the current issue of the journal “Proceedings of the National Academy of Sciences”. “Now that we know how meprin β looks, how it works and how it relates to diseases, we can search for substances that stop its enzyme activities when they become harmful”, explains Xavier Gomis-Rüth, researcher at the Molecular Biology Institute of Barcelona, who led the project. Meprin β is an enzyme that is anchored in the outer wall of cells. Its normal function in the human metabolism is to cut off certain proteins, e.g. growth factors, that are also anchored in the cell wall. In this way meprin β releases protein fragments into the environment surrounding the cells – a natural and normal process, as long as it occurs at a certain intensity. However, under specific circumstances, meprin β may function abnormally, and, for example, releases too many protein fragments. The protein pieces than overdo their natural task in the cell surroundings, causing disorder in the human body. Such disorder typically occurs when inflammation, cancer or Alzheimer’s Disease get started. In their study, the scientists found out that meprin β consists of two identical molecules building a dimeric structure with a cleft in the middle. “We also discovered that the active site cleft is something like the scissor of the enzyme, the actual place where the proteins are cleaved”, explains Christoph Becker-Pauly, researcher at the Institute of Biochemistry at Kiel University, and principle investigator of the Kiel Collaborative Research Center 877 „Proteolysis as a Regulatory Event in Pathophysiology“. Molecular biologist Gomes-Rüth points out to the next research goal: “We now need to find a substance that fits right into the cleft and will thus block the cleaving activity of meprin β.” Such a substance could be the key to new therapeutical drugs against inflammation, cancer or Alzheimer’s Disease. The research has been carried out in collaboration with scientists from Max Planck Institute for Biochemistry and Johannes Gutenberg University Mainz (Germany) as well as University of Bern (Switzerland). Caption: The enzyme meprin ß is located at the cell wall (lined-up white balls). 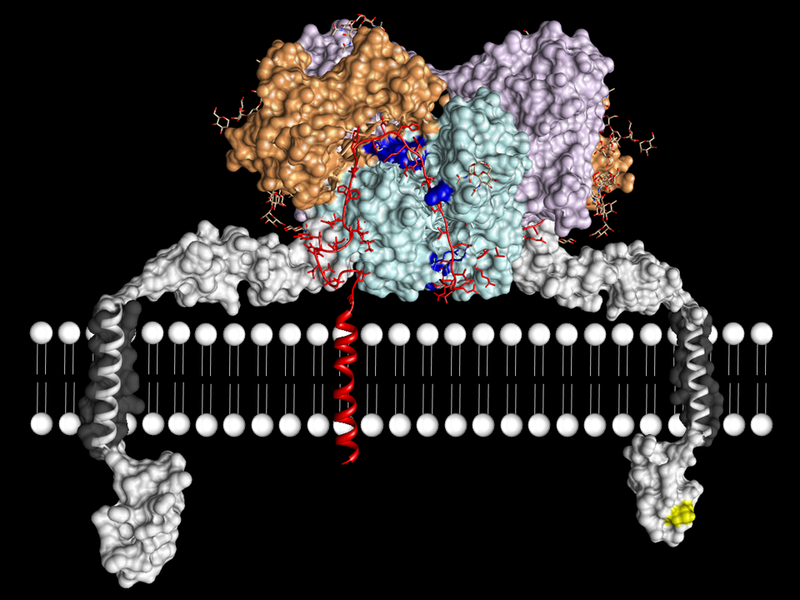 The enzyme binds a protein (red) within its active site cleft (light blue) to cleave it. Conceptional image.